This month, the NWO Central Works Council (COR NWO) has been advising on the investment needed for SRON’s new accommodation in Leiden. 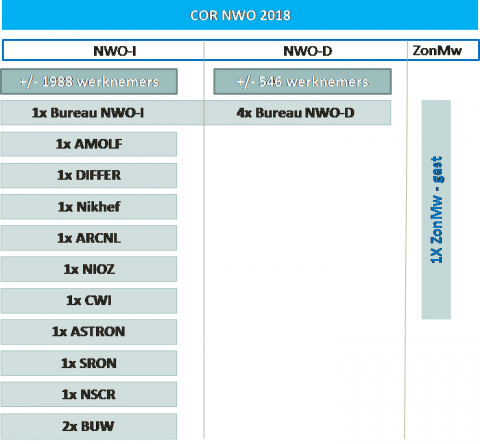 COR NWO has also approved the transition scheme for the implementing regulations (2018-2019). From now on, COR NWO will introduce its members in this newsletter. This month’s issue features Sjoerd Wouda from AMOLF and Robbert Bloem from ARCNL. Introducing a new COR column: get to know the COR members! Who are those colleagues who meet with the executive board once a month to discuss NWO issues on the employees’ behalf? This month we introduce you to Sjoerd Wouda (AMOLF) and Robbert Bloem (ARCNL). The interviews are here. Plans are in hand to move the NWO Institute SRON from its current location in Utrecht to the campus of Leiden University. NWO will invest in a new building for SRON. The NWO executive board asked the COR NWO for advice on this investment. COR NWO considered whether the extent of the investment is clear and whether the risks for NWO are being minimised. COR NWO issued a favourable recommendation on the investment at the beginning of March. It also recommended that NWO should make it attractive for staff to relocate to Leiden and involve SRON employees closely in the plans for the move. COR NWO hopes the investment will lead to a successful relocation for SRON. It is unlikely that anyone will have missed it. New NWO implementing regulations are in force for 2018 and 2019. Late 2017, COR NWO and the employers reached agreement on the text of the new NWO implementing regulations. COR NWO believes that the best possible outcome has been achieved and in February it approved the implementing regulations transition scheme. Any adverse consequences for individual wage slips will be scaled down over an eight-year period. COR NWO will monitor the implementation. Any idea of the composition of COR NWO? COR NWO currently has 16 seats and one guest seat. Because pictures say more than words, an organigram is shown on this page. Visit the NWO-I website: www.nwo-i.nl/cor or email your questions, comments or suggestions to cor@nwo.nl.